Before hitting the speaking scene, Christine was a university admissions officer, corporate trainer and broadcaster. Hey - she even votes. Christine holds a Bachelor's Degree in Communication and a Master's Degree in Adult Education. She is a member of the National Speakers Association and is a Certified Speaking Professional (CSP). 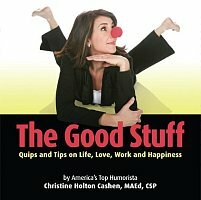 With her incredibly humorous and relatable style, Christine gives you the tools to identify, understand and approach conflict creatively. Your audience will discover the secrets to defuse anyone in any situation, blow off steam before you boil over, and bring peace to all across the land. Christine's conflict and teamwork program is a wonderful interactive break-out session, sure to help your group identify, understand and approach conflict creatively. Get ready to bring more fun into your work day, as expert speaker and motivator Christine Cashen brings you this fast-paced, entertaining program. You'll discover the keys to having more fun, improving productivity and morale, while at the same time lowering stress and improving job satisfaction! This program is ideal for an opening keynote to energize the audience or the perfect closing keynote to end your conference with a bang!